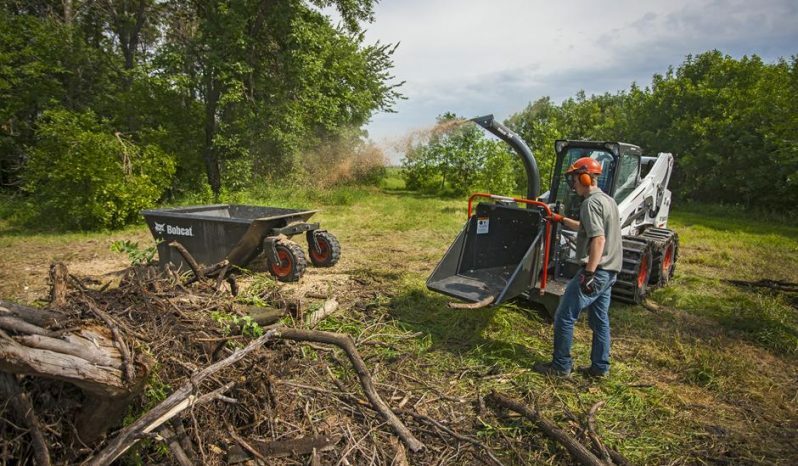 Using a powerful disk chipping action, the chipper attachment continuously mulches materials – up to 5-in. in diameter – such as trees, limbs, branches, and saplings. 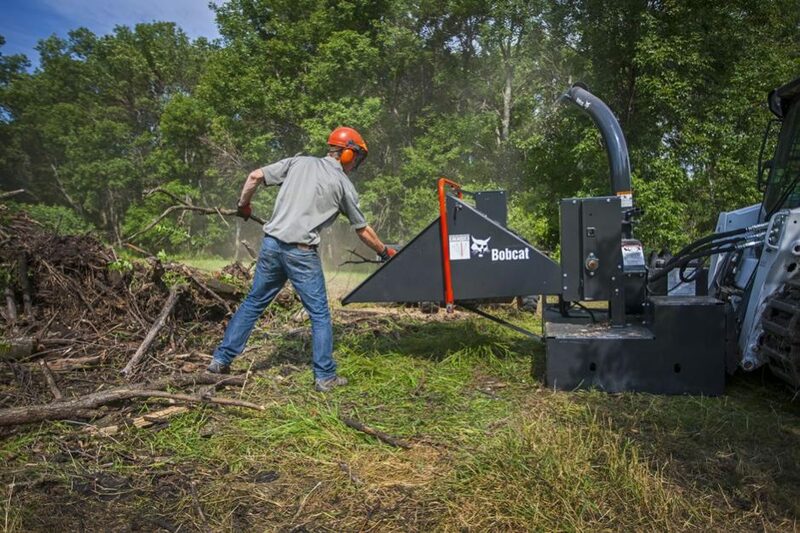 The chipper attachment is ideal for tree removal, pruning services, municipalities, parks and recreation, rentals, and personal property maintenance. 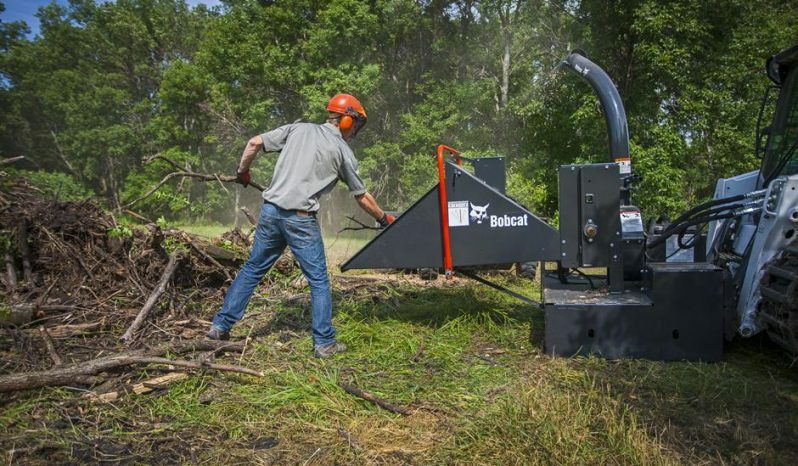 Unlike pull-type chippers, the Bobcat® chipper attachment can perform chipping jobs virtually anywhere! The compact design of the chipper attachment can tackle tough terrain. 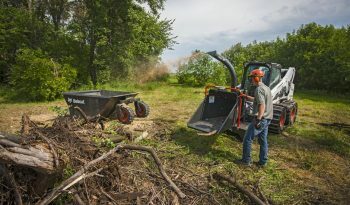 And it operates in any environment where a loader can travel, allowing wood mulching right on site rather than having to haul wood somewhere else. 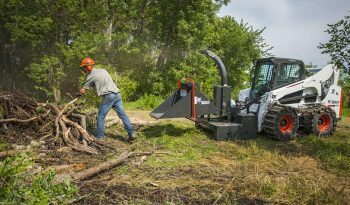 A hydraulic power feed allows the feed roller to move branches into the chipper at a constant speed. 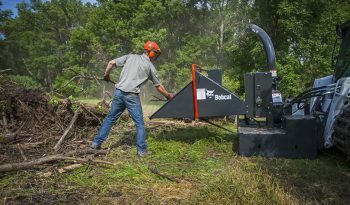 The chipper attachment breaks brush into small chips and discharges the chips through the discharge chute, which can be rotated 360-degrees for maximum angle positioning. Also, the discharged small chips decompose faster than branches or large chips. The 5A chipper features a 5-in. feeder opening and chips material up to 3 in. in diameter. 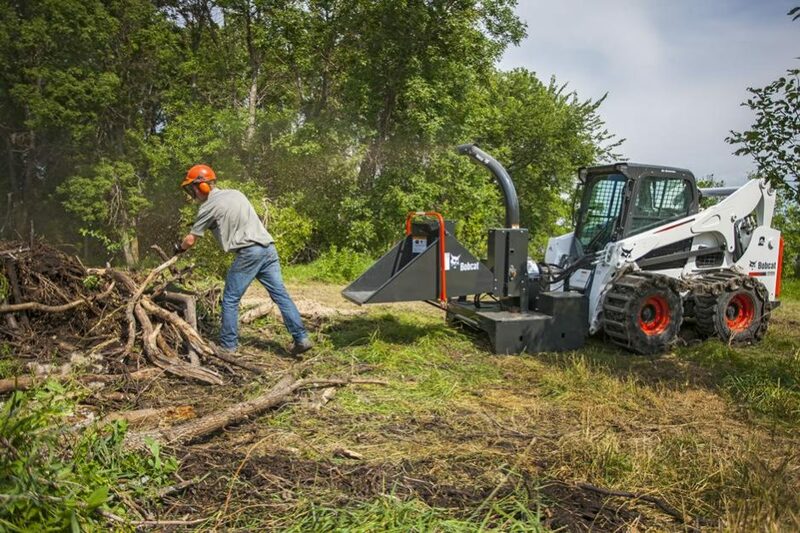 The 8B chipper offers even more versatility, with a 9-in. feeder that chips materials up to 5 in. in diameter. Adjustable Deflector: Located on the discharge chute, the adjustable deflector reduces the distance chips are thrown from the attachment and deflects the chips into a desired work area, allowing for more control over discharged materials. Chipper Discharge Chute: Rotates 360-degrees, providing maximum angle position for discharging materials without having to reposition the chipper attachment. Adjustable deflector also helps direct chips in the desired direction. Chipper Disk: Made from 1.25” steel, the chipper disk provides heavy-duty strength when cutting heavy material, allowing the chipper attachment to maintain momentum while cutting. 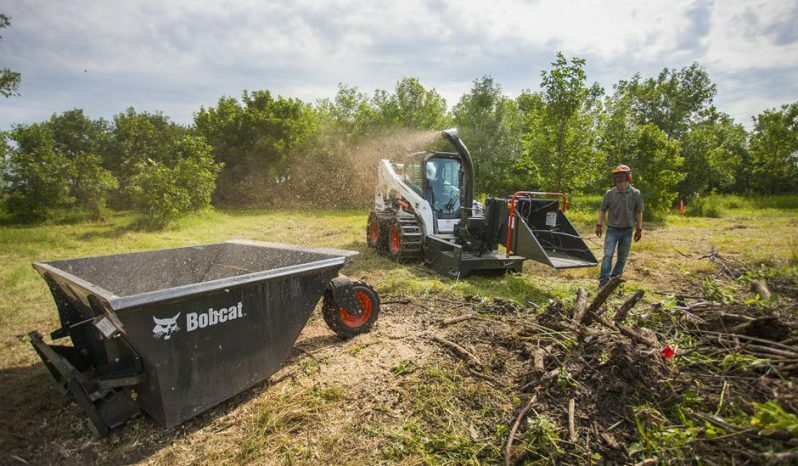 Dual Mounting Locations: Allow the intake housing to be mounted to either the front or right side of the machine, allowing the chipper attachment to accommodate different applications. Four Tool-Steel Blades: Positioned at different angles, the four blades provide optimum cutting performance while the tool-steel extends blade life. Blades are also reversible for twice the life between sharpening, decreasing maintenance time and maximizing productivity. Hydraulic Power Feed: Directs branches into the chipper attachment. 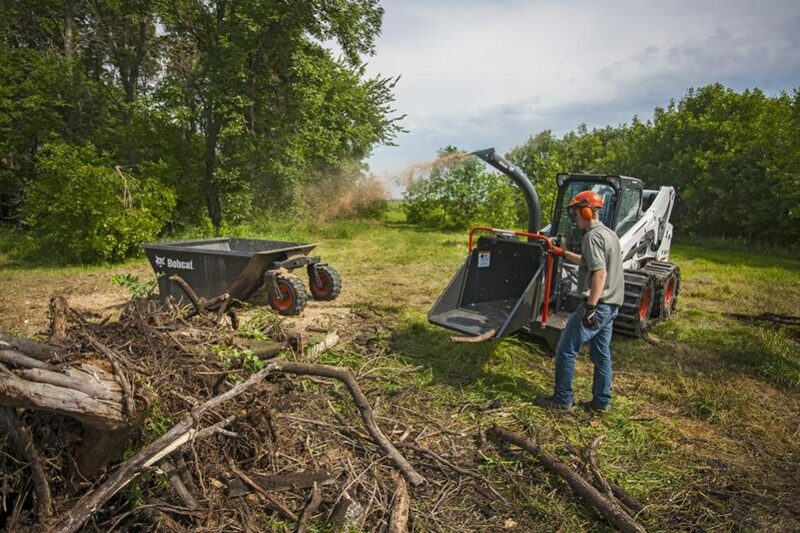 The operator only needs to get the branches started, meaning overall reduced operator fatigue. Variable Speed Roller: Gives the operator the ability to set the initial feeding speed as well as distribute power between the feed roller and grinding wheel, providing maximum operator control.